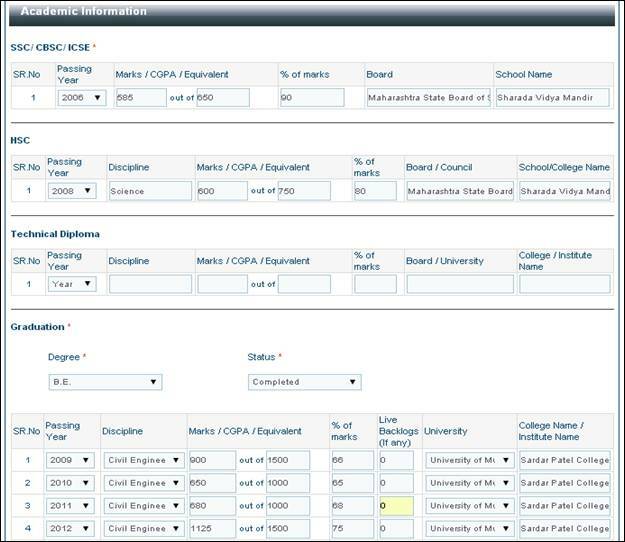 All fields marked as ‘*’ in the form are mandatory. Kindly ensure that you Save the information filled in each section before proceeding to the next section. Please go through the General Instructions and keep all the information ready before proceeding with filling the application form. Please go through the Payment Instructions and Payment process demo carefully before proceeding with the application fee payment. Please note the information entered in the snapshots is for demo purposes only. a. Click on the dropdown menu to select the Programme-Campus for which you wish to apply. You must select atleast one Programme. You can give maximum five programme preferences. b. Click on ‘Add (+)’ button to add Programme preference. c. Click on ‘Delete (-)’ button to delete Programme preference. a. Click on the dropdown menu to select the Test Center.You must select test center as Pune. b. Click on ‘Save and Make Payment’ to make your application fees payment. 1. Click on Proceed to Payment to continue to the payment gateway for payment. Select your desired payment gateway to pay from either “Proceed to Pay with Billdesk” OR “Proceed to Pay with Techprocess" OR “Proceed to Pay with Citrus”. 2. You will be directed to the payment gateway you selected; For Citrus Payment Gateway, enter your personal details and Click on Continue to Pay. 3. Select Cards(For any Card Payment) OR Banks(For Net banking) and enter Net banking/Credit Card/Debit Card details & click on Pay Now/Make Payment to start the payment process. 4. On successful payment you will receive the following screen. Wait until you receive the following screen. DO NOT close the browser. Application fee once paid is non-refundable, non-transferable and will not be carried forward. 5. In case of failed payments, you will receive the following screen. 6. For any payment related queries kindly contact the NICMAR Admissions Department at (020)66859271/270/166 OR Email: onlineadmission@nicmar.ac.in. 7. 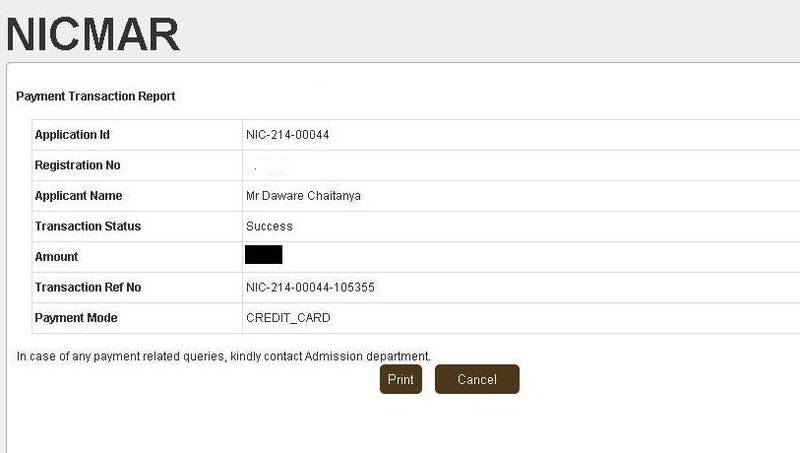 After successful payment of application fees, you will be able to access whole application form to fill your information. Complete Step 3 to Step 8 to Submit the complete Application form. Important Note: After successful payment of Application fee, you must fill the complete form and submit it within 5 days from payment of application fee or last date of submission of application form whichever is earlier. We strongly recommend that you do not wait until the deadline to submit your application. Server traffic around the deadline may cause technical difficulties. Timely submission of the form will enable faster processing of your application. Non-editable. As entered in the registration form. Last name/Surname or family name. Indian or Other. If Other, please specify. Select appropriate range of gross annual family income. Provide a secondary email ID you may have access to. Provide an alternate landline or mobile number. Provide details of any medical health condition. Please enter the appropriate details. Provide Parent/Guardian landline or mobile number. Enter your House number/Flat number/Society name/ Street name etc here. Please specify the Year of passing. Please specify the Marks obtained and the Total maximum marks in 10thstandard. Please specify the 10th standard percentage obtained. Please enter the full name of the Board. Please enter the full name of the School. Please specify the Marks obtained and the Total maximum marks in 12thstandard. Please specify the 12th standard percentage obtained. Please enter the full name of the Board/Council. Please enter the full name of the School/College. Please specify the Marks obtained and the Total maximum marks in technical diploma. Please specify the percentage obtained in technical diploma. Please enter the full name of the Board/University. Please specify the yearwise Marks obtained and the Total maximum marks. Please specify the yearwise percentage obtained. Please specify yearwise number of live backlogs (if any). Please select the University from the list of Universities. If not listed, select the other option and enter the full name of your University. Please specify the post graduate degree name. Please specify the post graduate discipline. Please specify the Marks obtained and the Total maximum marks in post graduation. Please specify the percentage obtained in post graduation. Please enter the full name of the University. Please specify the Year of appearing for the test. Please specify the Marks obtained in the particular test. a. Click on the “Choose File” button. c. Click the “Open” button. d. Click on the “Upload” button. a. Click on the “Submit Application” to submit your complete application form. 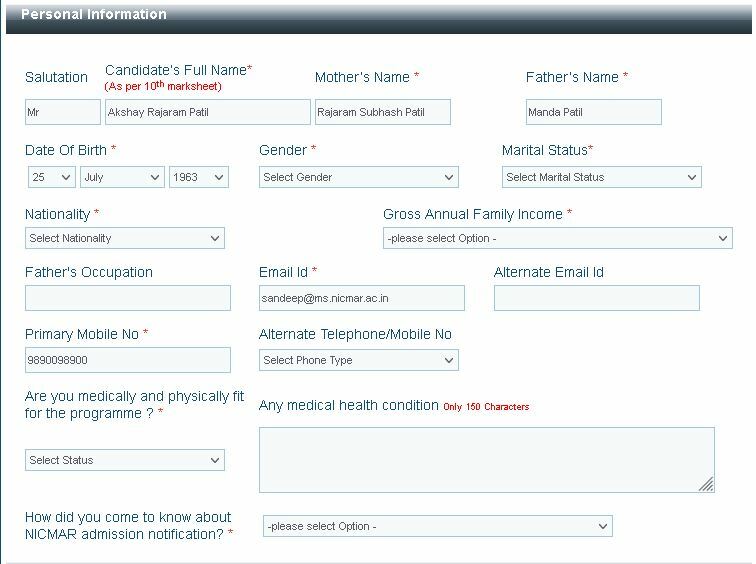 Check the information filled in the completed application form before clicking on "Submit Application' button. Once Submitted, you will not be able to make any changes. Important Note: Your complete Application Form will not be received by us until you complete this step(Step No 8).